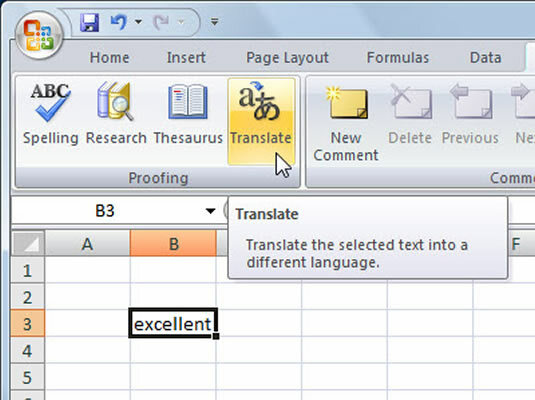 Microsoft Office Excel 2007 provides access to translation tools on the Research task pane that enable you to translate words or phrases by using bilingual dictionaries. To quickly look up a word or phrase that is located in a worksheet cell, press and hold the Alt key and click the cell. 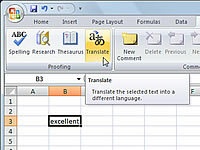 The Research task pane opens with the translation displayed in the list box. 1(Optional) Select the cell containing the word or phrase you want to translate. If you prefer, you can type the word or phrase directly into the Research task pane. 2Click the Translate button in the Proofing group on the Review tab. The Research task pane appears with the Translation option selected. 3If necessary, change the languages you are translating From and To in the drop-down lists under Translation in the task pane. You can click the Translation Options link in the Research task pane to customize the resources that are used for translation. 4Type (or edit) the word or phrase in the Search For box, if necessary, and click the Start Searching button. The translation results appear in the list box of the Research task pane.